"This is a great, quick and easy weeknight meal. The one-pot pressure cooker makes clean-up a snap and brings dinner to the table quickly!" Season pork chops with salt and ground black pepper. Melt 2 tablespoons butter in a pressure cooker over medium-high heat. Working in batches, cook pork chops in hot butter until browned on both sides, 3 to 5 minutes per side. Transfer pork chops to a plate. Melt remaining 2 tablespoons butter in the pressure cooker. Saute carrots and onion in hot butter until fragrant, about 2 minutes; add broth and Worcestershire sauce. Return pork chops to the pressure cooker pot. Set a steamer basket on top of the pork chops and place potatoes in the basket. Cover the pressure cooker with the lid, lock the lid, bring the cooker to high pressure, and cook under pressure for 13 minutes. Release pressure from the pot according to the manufacturer's instructions. Slice potatoes along the top and serve. See how to make tasty, tender chops slowly cooked in a flavorful sauce. Additional ready time is added because of time needed to bring pressure cooker to pressure and time for natural release. Time will vary depending on your cooker. Can be made without carrots. Can use steak sauce instead of Worcestershire sauce. Can use chicken broth instead of vegetable broth. Use a 6-quart or larger pressure cooker. 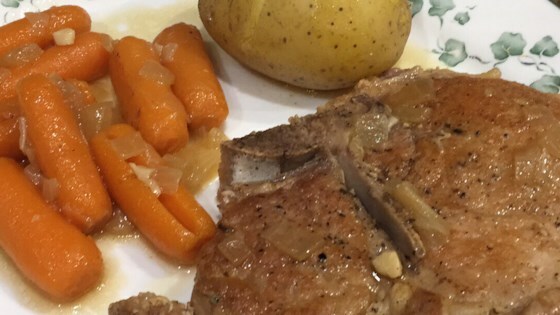 I cook a lot and I followed directions to a T. It was tender, but my entire family thought the pork chops were bland. The vegetables were good. Fantastic recipe--my husband remembers and asks for it! Used boneless chops, but otherwise followed exactly--the chops were so tender they were falling apart! Even the picky nine year old gobbled it up--thanks so much for this recipe!!! My wife loved it. I substituted a can of V-8 juice instead of the vegetable broth, and I added one beef bouillon cube.